Content Marketing is being touted as the ‘new SEO’, but good SEOs have been building great content for years. A solid content marketing strategy will compliment your link building efforts to gain trust and authority in your niche. 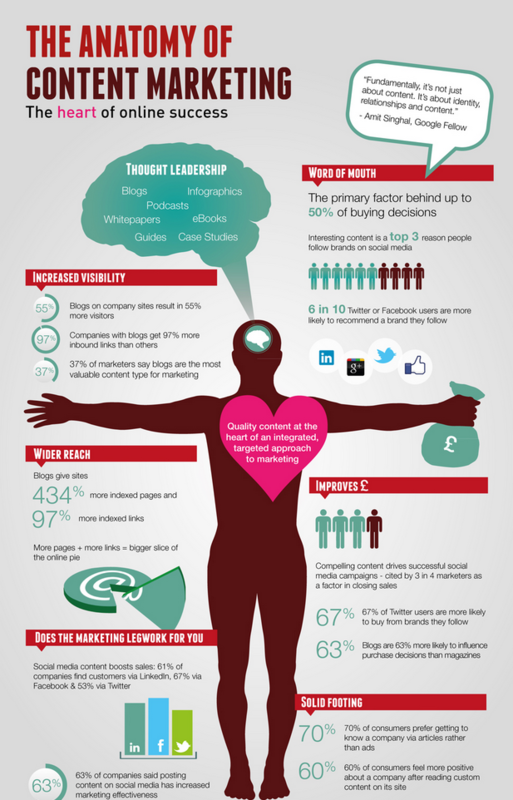 Find out below what content can do for your business, or get in touch to with me. I also offer a Digital PR service for clients looking to secure high end links. Content Marketing is the creation and distribution of digital content to achieve business goals. Here’s a good video from the Content Marketing Institute to help explain it. I can help you create your content marketing strategy and ensure it works with your brand message and reaches your potential clients. Once we have decided on the main goals, a schedule will be developed along with content idea generation. The content strategy will also be integrated into your social media campaigns. Many type of content formats can be used to build a content strategy. Below are some of the common types with example. Blog posts can come in many forms, but as long as the reader is given some good insights or takeaways they are likely to come back. Example: Quicksprout’s Content Marketing Guide is an awesome post consisting of detailed content and great design, although it long for a blog post example. Example: Our own James Bond themed infographic did very well, exceeding all our targets. The introduction of HTML5 has allowed developers to create amazing pages that users can interact with. This type of content is expensive, but great for social shares and attracting inbound links. Video content is becoming more popular with publishers and great for Social Media campaigns. I am currently setting up a video content business producing social videos and explainer videos to help conversions, find out more here. Example: Redbull use Video through their social media channels very well receiving huge amounts of shares and likes. Explaining how to solve a particular problem in your industry likely to do well if its comprehensive. BBC’s ‘click’ has a very popular podcast channel, which can be accessed via itunes. These podcasts completment the video series the BBC produce. Content Marketing, like SEO, is continually evolving. New technologies allow content creation and curation much easier and this will continue. The costs of developing beautiful html 5 pages will drop and this will really help competition within the industry. As more companies understand the need for a content marketing campaigns, suppliers will be put under more pressure to deliver content marketing KPIs.